A NEW truck stop in one of the transport industry's growth areas has been saved by an experienced couple keen to offer drivers something different. Truck drivers coming into Toowoomba on the Warrego Highway from out west were left high and dry for nearly six months after the Coolabah Tree Cafe closed suddenly at the Caltex service station in Charlton. The swift exit put about a dozen people out of work, while site owners Jack and Tom Ray scrambled to find a new tenant to continue the service. 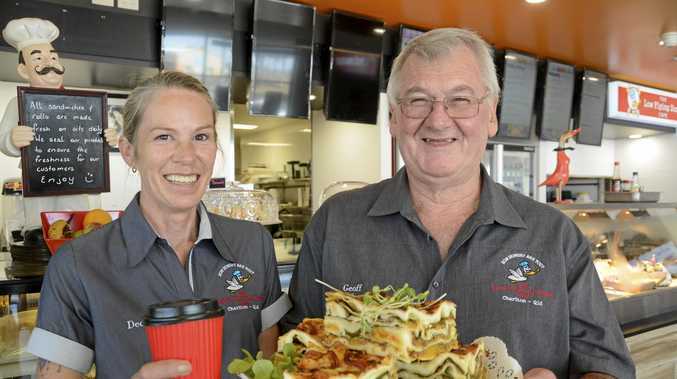 Enter veteran truck stop operators Geoff and Dee Pevitt, who decided to sell their highly-successful roadhouse in Deniliquin to set up the new Low Flying Duck Cafe. "We were managing this truck stop in Deniliquin in NSW near the Victorian border," Mr Pevitt said. "We met with the owners of the site, the Ray boys, and they were magic people. They convinced us more than anything else. "We've seen the development happening out here, we've received nothing but support from the Toowoomba Regional Council. "That's why we believe our business will only get better." Charcoal with your latte? : A Toowoomba cafe is serving a new black beverage - charcoal coffee. Yep, it is a thing. The couple, who were now closer to Dee's family in Millmerran, also recruited six employees including some of the ex-Coolabah staff. Mr Pevitt said he and his wife knew what truckies wanted and how to keep them coming back. "Truckies want peace and quiet, they want a good home-cooked meal that they nearly can't finish, but they want quality," he said. "They're sick of going to roadhouses that fill the bain-marie and serve out of it. Our hot box, the food is only in there for an hour. "People are finding that our food quality is as good as a city cafe." Mr Pevitt said all food was made on-site that day.